Launched in 1960, reference 3429 was cased predominantly in yellow gold. To date, only two examples in platinum have surfaced on the market, making this example incredibly rare. Compounding to this astounding rarity, the piece is offered in extremely attractive condition: the edges and proportions of the case are perfectly preserved, and the hallmark to the band - a particularly sensitive location - is perfectly discernible. The dial as well appears to be unmolested, featuring raised hard enamel graphics and a gentle ivory patina. The movement beating inside this remarkable specimen is furthermore one of the most celebrated automatic movements of all times: cal. 27-460, the name given to the final evolution of legendary calibre 12-600AT, considered by many the gold standard for automatic movements. 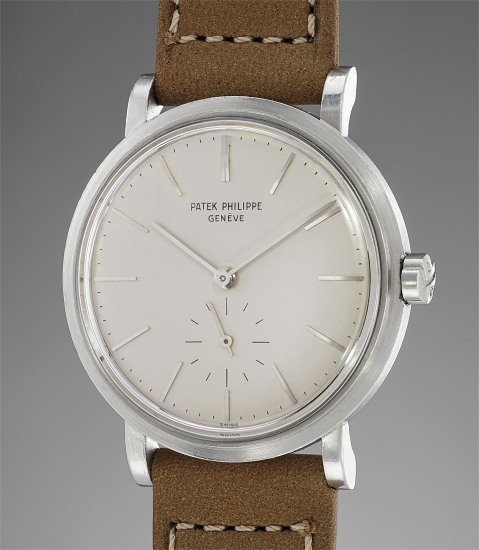 Reuniting absolute rarity, outstanding condition, timeless elegance, mechanical perfection, and the presence of its original box and Certificate, the present wristwatch would delight the most spoilt vintage Patek Philippe collector.